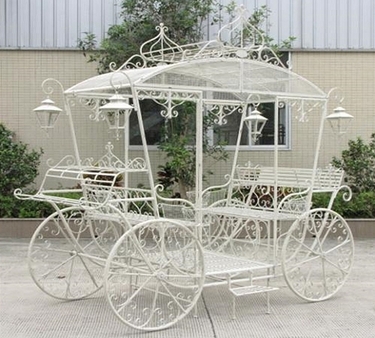 Our beautiful new Large Cinderella Carriage Stand is simply a stunning immersive garden and event display piece that will make your photo opportunities for weddings, event celebrations, birthdays, or backyards elegant and miraculous! Get ready to step inside this real life fairytale piece - seriously, you can can step inside! Two facing benches can easily fit four adults. Both ends have locations for plants to rest and hand, and 4 decorative lanterns that can house tea light candles for added evening charm. Movable wheel will allow you to moving this piece into the right spot by lifting one side, but this display piece is not intended to be moved when people are inside. Available in two finishes, one is an elegant bronze, and the other is an antique white.